When my son Mark was in the third grade, his teacher assigned a series of “Famous People” reports. Over the course of the year, each student researched and reported on three famous people who have had an impact on history or culture. First, Mark researched and presented a report about Walt Disney. Allusions to the characters Disney created and their personalities, words or habits are easily recognized by almost anyone—child or adult. Mark learned a lot about the man’s childhood and early career. He created a collage with pictures of Walt and his famous animated characters. So my son can say he knows a lot about Walt Disney. But he would have to concede he really never knew Disney personally. Tiger Woods presented an enjoyable opportunity for Mark to research an interesting sports figure. Of course, at the time, Tiger’s career was already historic and his personal life seemed unassailably happy. While presenting his report, Mark wore a red shirt to portray Tiger’s superstitious affection for his good-luck attire. A Nike visor completed the “look”, and a rundown of all Tiger’s career accomplishments in golf made the presentation complete. So, my son can say he knows a lot about Tiger Woods. But he would have to concede he really doesn’t know Tiger personally. I’m not sure I’ll ever get all the black felt fiber out of the sewing machine feed. It’s been there since I sewed the black top hat for Mark’s third character. The third report Mark completed involved a man who had a profound impact on our nation’s history. From his early days in Kentucky to his rise to the White House, this man held high ideals and was a paragon of moral character. Whether in personal tragedy or national crisis, Abraham Lincoln maintained a vision of justice that ranks him among the most honorable men who ever lived. My son could say he knows a lot about Abraham Lincoln. But (you know it!) he would have to concede he never really met or knew Lincoln personally. Could it be that, as you approach the manger of Bethlehem—if you even contemplate it at all while shopping, wrapping, scheming and dreaming this year—you are among those who know ABOUT Jesus, but don’t really know Him personally? And let me stop you right there before you say, “Of course I know Him. I accepted Him as my ‘personal savior’ on the umpteenth of July, 1972 at a revival meeting in Squirrel Trail, Alabama.” Let’s not pretend that American individualism and the ‘personal savior’ thing matters to God more than it does. Of course He saves sinners as individuals, but that’s not the heart of His eternal plan and purpose…not according to the Bible anyway. I’m not writing here for the “lost” who have never even met Him…I’m writing to you, Believer. Do you know a lot ABOUT Jesus? It’s a good thing to know a lot about Him. But search your heart…do you KNOW HIM? People who know a lot about Jesus might choose Christmas cards with a faith-based message over cards with reindeer and jingle bells as the theme. But, look at the cards we choose. Are they designed to convey a “holy” atmosphere over a babe in a manger with gilt and rich colors? Or could we accept a card that comes close to capturing the stench of a stable and the raw poverty of His birth? 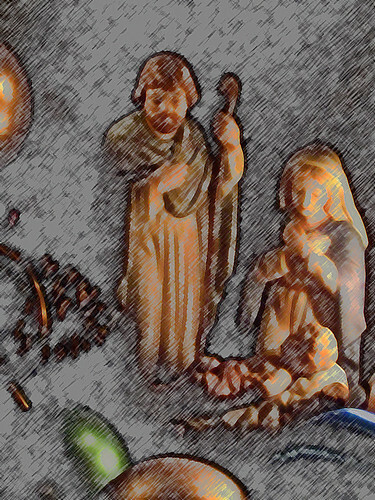 In our romanticized, sanitized recognition that the Holy Creator God entered human history as a human baby, can we find a reminder that He arrived as a helpless child, born into the poorest imaginable family, hunted and persecuted from infancy by the rulers of His world? Can we remember that He didn’t come home from a hospital to a freshly painted, color-coordinated “nursery” in a house that has more bedrooms than some villages? Will it spoil our “holiday spirit” to be reminded that the plan wasn’t for Him to grow up and go to the best university, have a “successful” career and win a Nobel Prize? No…His destiny was a criminal’s death on a wooden cross, to be placed into a tomb…and to be resurrected, the firstborn of many brethren. Many brethren…not just someone’s “personal savior”. I’ve said it before and I’ll say it again. If we don’t view Christmas through the lens of Easter we will totally miss the point. And if we reduce it to our observance of traditions and customs that make it about gifts, lights, pretty scenes, sentimental stories about benevolence and hearts that magically grow larger at Christmas, we really miss the significance of Emmanuel, God with us, coming into the squalid misery that is the essential reality of every human being when you strip away the “success” and the “security” we create for ourselves. Apart from Him there is no lasting value in anything we cherish. The Samaritan woman at the well received a revelation from Jesus Himself that the Father was seeking those who would worship “in spirit and in truth”. You can “be saved” and know a lot about Jesus, but only those who really know Him can worship in spirit and in truth. Of course, one of the things we “evangelical” Christians insist upon is that all things were created by Him. But let’s stop for a moment to consider the rest of Paul’s declaration: all things were created for Him. If we linger too long over the fact that we can each have a “personal savior” we can make it—and often have made it—all about us! We allow ourselves to experience Him “individually” as a collection of “saved” individuals observing customs and traditions that we say are about Him when they are really about us. “It just doesn’t seem like Christmas if we don’t_______.” We’ve created traditions that are for us. If we really know Jesus we can stop trying to experience Him through things we create and rest in the knowledge that we—and everything else—were created for Him. Now, that’s a God we can truly adore! The first eighteen verses of the first chapter of John’s Gospel explain Jesus as the Creator God with a purpose that reaches far beyond that of a “personal savior”. How often have you read John 1:12-13 without stopping to ponder your status…not as a saved individual but as a member of God’s family?